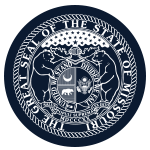 Mission: The Missouri Southern State University Board of Governors acts on behalf of the people of Missouri to oversee the successful implementation of well-planned and sound academic programs of higher learning for the benefit of the students of the college. Function: The Missouri Southern State University Board of Governors appoints the president; supports the president; reviews the performance of the president; clarifies the institution's mission; approves long-range plans; oversees the education programs; preserves institutional independence; ensures financial solvency; enhances the college's public image; and assesses the board's performance. Geographic Requirements: yes, six voting members shall be selected from any of the following counties: Barton, Jasper, Newton, McDonald, Dade, Lawrence, and Barry provided that no more than three of these six members shall be appointed from any one county. Two voting members shall be selected from any of the counties in the state which are outside of the counties previously articulated.